Written by Kevin Murphy, 1998. Last updated: 7 June 2004. This toolbox supports filtering, smoothing and parameter estimation (using EM) for Linear Dynamical Systems. What about non-linear and non-Gaussian systems? Other software for Kalman filtering, etc. A Linear Dynamical System is a partially observed stochastic process with linear dynamics and linear observations, both subject to Gaussian noise. It can be defined as follows, where X(t) is the hidden state at time t, and Y(t) is the observation. The Kalman filter is an algorithm for performing filtering on this model, i.e., computing P(X(t) | Y(1), ..., Y(t)). The Rauch-Tung-Striebel (RTS) algorithm performs fixed-interval offline smoothing, i.e., computing P(X(t) | Y(1), ..., Y(T)), for t <= T.
Here is a simple example. Consider a particle moving in the plane at constant velocity subject to random perturbations in its trajectory. The new position (x1, x2) is the old position plus the velocity (dx1, dx2) plus noise w.
We assume we only observe the position of the particle. Suppose we start out at position (10,10) moving to the right with velocity (1,0). We sampled a random trajectory of length 15. 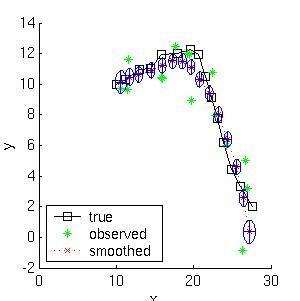 Below we show the filtered and smoothed trajectories. The EKF can be used as a proposal distribution for a PF. This method is better than either one alone. The Unscented Particle Filter, by R van der Merwe, A Doucet, JFG de Freitas and E Wan, May 2000. Matlab software for the UPF is also available. SSPIR package in R. The system identification toolbox from the Mathworks implements many classical algorithms. ARfit is an excellent package for autoregressive models. Zoubin Ghahramani has matlab code for EM in LDS's which is similar to mine, but is partially written in C.
KBF, an implementation of the Kalman filter-smoother in Omatrix, a (supposedly faster) version of matlab. Econometric Links Econometrics Journal. Most of the software is either commercial or written in Gauss, which is similar to Matlab. SSF pack is a set of C routines for state-space filtering. Welch & Bishop, Kalman filter web page, the best place to start. T. Minka, "From HMMs to LDSs", tech report. K. Murphy. "Filtering, Smoothing, and the Junction Tree Algorithm",. tech. report, 1998. Roweis, S. and Ghahramani, Z. (1999) A Unifying Review of Linear Gaussian Models Neural Computation 11(2):305--345. M. Arulampalam, S. Maskell, N. Gordon, T. Clapp, "A Tutorial on Particle Filters for Online Nonlinear/Non-Gaussian Bayesian Tracking," IEEE Transactions on Signal Processing, Volume 50, Number 2, February 2002, pp 174-189.